As a fiber artist I am constantly excited and inspired to learn new techniques. Learning from those that have great tips and tricks makes more Ah-ha! moments happen. My passion is to share what I have learned so that you too can have Ah-ha! moments. As a professional educator I strive to create the best possible experience for my students. I put a great deal of time into crafting clear, fun, and information packed workshops. It is always my goal for you to leave feeling confident and inspired! Click below to read about the workshops I offer. If there is something that you or your venue would like me to teach, you can use the contact form to request something more specific to you or your group's needs. Did you ever purchase a hand painted top and spin it only to be disappointed in the final color outcome? This workshop is based off of my book, "A New Spin On Color" and is a best seller. In it we analyze how dyed tops and rovings are painted and how the fiber can be spun in 12+ ways to yield different color combinations in the final yarn. The focus will be on color and how to achieve beautiful color results instead of mud. Now that your spinning skills are beyond the beginning stage you might be curious if you can spin for a specific project in mind. This workshop will focus on picking a project and how to spin the desired yarn for it. Fiber choices will be analyzed, drafting, spinning, and plying techniques will also be discussed to help you achieve the yarn you want. How to calculate the amount of fiber needed will also be addressed. This workshop covers the best fiber choices for spinning sock yarn, analyzing yarn qualities that make a good sock yarn, spinning techniques to achieve spinning for socks, and plying techniques for durable socks. This workshop is aimed for a spinner that has recently come into spinning and they’ve just got the basics down but would like to learn tips and tricks to make spinning more enjoyable, to understand their wheels and what it can and can’t do, and how to improve their spinning consistency and plying techniques. Learn how to create yarn using a simple tool called a drop spindle. You will have useable handmade yarn by the end of the workshop. Time permitting students will be taught how to Andean ply. No previous experience necessary. This workshop focuses on how the color choices a spinner makes prior to sitting at the wheel influence the final outcome of color in their projects. It will help you as a fiber artist achieve the color combinations you want rather than making mud. Fiber preparation choices will be discussed and then techniques for spinning color will be the main focus. 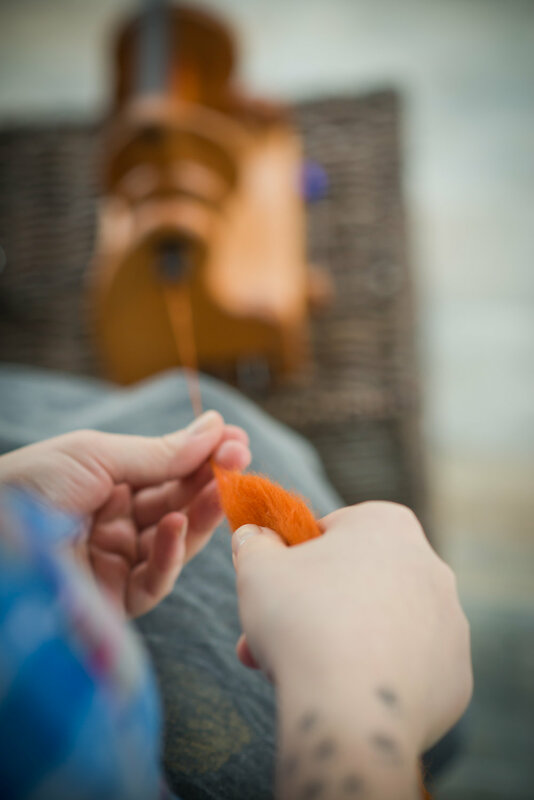 This workshop aims to teach spinners how to prepare fiber both from a clean fleece and commercially dyed wool to create fiber that is a dream to spin. Different fibers will be used so students can see how the fiber and its preparation can influence the final yarn. Understanding the way you draft fiber can help you control the look and function of the yarn you spin. 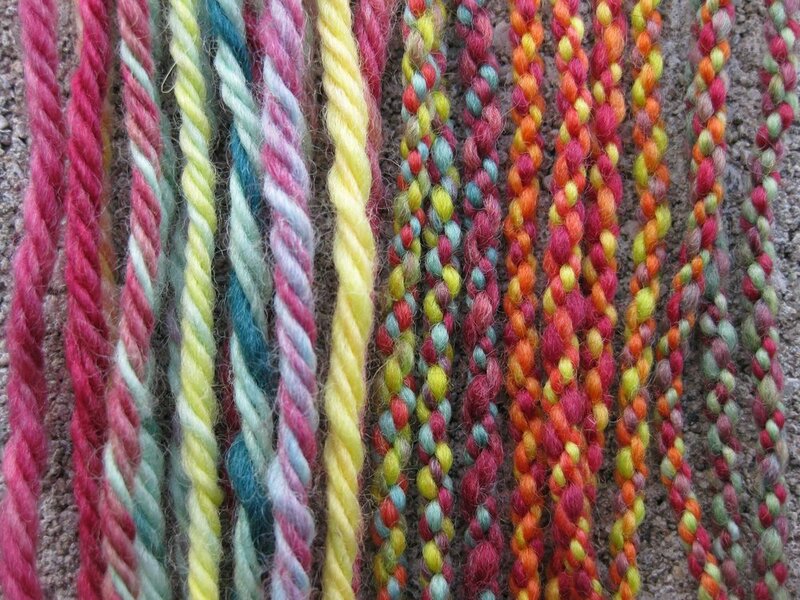 This workshop focuses on different ways fibers can be prepared and spun and what the resulting spinning techniques yield in the final yarn. Often after a spinner learns how to spin consistently, they can get stuck in a rut and spin one kind of yarn over and over again. What happens when you want to break out of your spinning rut? Students in this workshop will learn techniques they can use to alter the yarns they spin to achieve lofty thick yarns or finer more delicate yarns and everything in between. Once you’ve mastered the basics of yarn construction the fun begins to try your hand spinning novelty yarns. In this workshop you will learn how to spin different types of novelty yarns both in the construction of the singles and the ply.